Respect is a positive feeling of esteem a person. Respect is both given and received. We expect other people to respect us in return for the respect we show them. 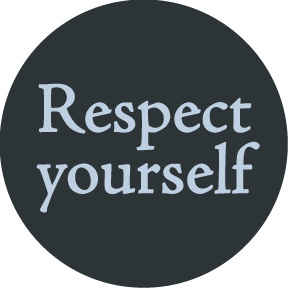 Respect cannot be measured as a quantity, cannot be bought or traded, it is one of those things that is earned and built over time, but that can be lost with one stupid or inconsiderate act. Respect should qualities means treating as equal. Are you love yourself? take care yourself? you know yourself? Respect meaning for me I am confidence about how I feel, how I care about myself. Yes, this is my opinion, because I live with myself and this is a never ending story – if I am not thing about myself nobody does. I know my limit – what can I do, what I couldn’t and I always challenged myself. I never promising (myself or someone else) just do it. I eat healthily, I take care my body, I am fit, I control my life, I focus on what I have and this is make me happy and grateful for my life. This entry was posted in Healthy Living and tagged difference, feeling, happy, Healthy Living, nature, respect yourself, simply by Susanna. Bookmark the permalink. I totally agree, respecting ones-self is vital to being the best person possible. Again another one who agrees, respecting yourself is the pivotal role of life. It is crucial for one to love and respect themselves. Even when things are not perfect, you know to love yourself enough to get back on the road that will make you feel better.